We’re excited to welcome Lucid Software to the Spectrum family. 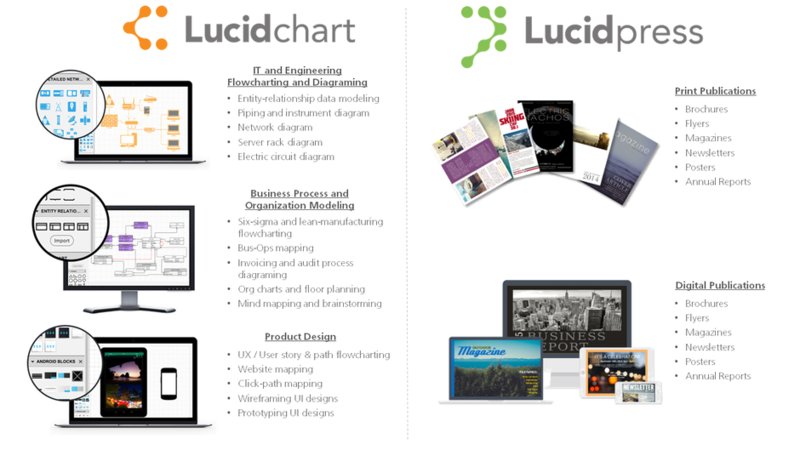 Lucid Software’s two market-leading products, Lucidchart and Lucidpress, are used by over 8 million users and hundreds of thousands of paying subscribers from more than 175 countries. 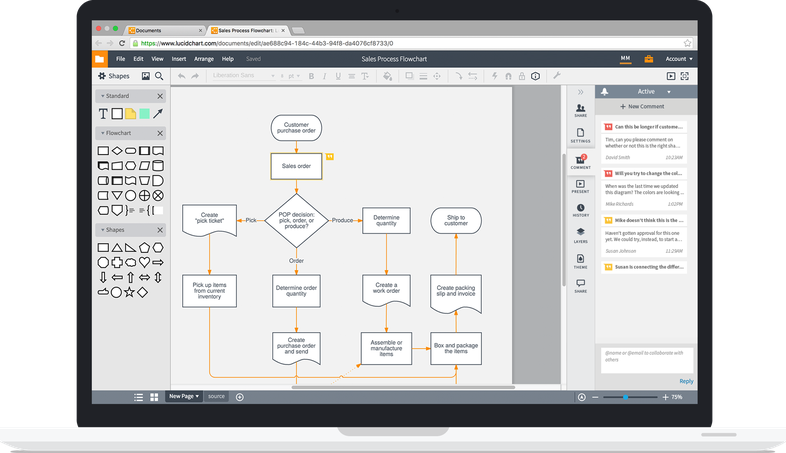 Lucidchart offers an intuitive and collaborative platform for building complex diagrams to improve productivity and visual communication, while Lucidpress enables brand-compliant layout and design for organizations of all sizes. Since the company’s founding in 2010, Lucid Software has grown its revenue by approximately 100 percent each year and has done so in a profitable manner. Although Lucid had raised $6M prior to our investment, the company had barely touched those funds and we were incredibly impressed by management’s commitment to a philosophy of balanced and profitable growth. We are thrilled to be partnering with such a uniquely talented team that is revolutionizing how people communicate and present ideas and collaborate on critical projects. Just check their GlassDoor ratings. We’ve had the pleasure of getting to know founders Karl Sun (CEO) and Ben Dilts (CTO), and Dave Grow (COO) over several years and throughout that time, we have been impressed by their product-first orientation and their focus on building the company in a thoughtful and sustainable manner. Lucid’s engineering team leadership has a reputation that precedes them, enabling them to recruit the best and brightest and build phenomenal products that delight millions of end users. It’s rare to see such raw talent throughout all levels of a company. What is particularly impressive, especially for a company as young as Lucid, is the bench-depth of its executive team – a testament to Karl, Ben, and Dave’s leadership and the enviable culture they’ve fostered. “Flowcharts? How big of a market can that be?”, is a justifiable reaction by someone hearing about Lucid Software for the first time. Big, frankly, is the answer. Many people asked similar questions about genealogy and surveys before we made investments in Ancestry.com and SurveyMonkey. Anyone who has a process to define or a complex design / diagram to create is a potential user – that’s a lot of people! Furthermore, when Microsoft acquired Visio (the legacy incumbent in this category) for $1.5 billion in 2000, it was generating nearly $300 million in revenue. What’s even more exciting than this fact is that Lucidchart has expanded beyond just core flowcharting into broader diagramming and product design. As we dug into how people are using Lucidchart, we found network engineers mapping out an IT network, HR managers creating org charts, electrical engineers creating circuit diagrams, UI / UX designers wireframing and prototyping app designs, office managers creating floor plans, and countless other use cases. At some of Lucid’s largest enterprise customers, there are now many thousands of end users working in the product each month and that continues to grow rapidly. Lucidpress further extends the product offering into graphic design, enabling even the most design-challenged users to create beautiful brand-consistent posters, brochures, flyers and other printed and digital collateral. It’s obvious that actually seeing a flowchart of a complex process is much easier than trying to explain or understand in words. The movement towards more images and less text is real, and is becoming increasingly evident in the way people communicate at work. Spectrum companies Animoto and Prezi, are good examples of how visual-centric communication provides for a more memorable and impactful dialog. Our investment in Lucidchart builds upon this thesis and enables users to visualize some of the most complex and tedious processes, concepts, and designs. Lucidpress also builds upon our investments in Jimdo, Litmus, and PicMonkey and the belief that design is being democratized, giving the average person the ability to create compelling images and marketing collateral that was once reserved for the highly trained design professional. The bar has been raised on the usability and interoperability of enterprise software. Today’s knowledge worker expects productivity applications to be beautiful, to be intuitive yet powerful, and to enable seamless collaboration. Lucid’s cloud-based products deliver on all these expectations and enables users, regardless of operating system and device, to share their work effortlessly and collaborate in real-time. In addition, Lucid’s core belief of enabling users to work with their products in any environment is demonstrated in their products’ integrations with Atlassian JIRA and Confluence, Google Drive and Apps, Microsoft Office, and Slack. All of the above has resulted in Lucid being the 8th fastest growing enterprise application amongst 4000 applications based on logins, according to this 2015 report. Coinciding with the increased expectations of usability and interoperability, is the increased expectation that there should be very few barriers to adopting best-in-class tools. Centralized IT purchasing, while still the lion’s share of how enterprise software is bought, is increasingly being complemented by bottoms-up adoption of the applications and platforms that best meet the needs of end users. We have been believers in the freemium model since its early days, with our investment in SurveyMonkey back in 2009 and our investment in Lucid highlights our continued conviction. With this freemium self-serve model, Lucid has been able to amass a valuable base of over 8 million users with very little paid marketing and no sales efforts prior to 18 months ago. Lucid has also seen adoption across an impressive and diverse list of large enterprises including Comcast, Ford, Lexis Nexis, Logitech, NASA, Netflix, Pearson, Quantcast, Spotify, Target, Uber, and Xerox to name a few. Although Lucid built a rapidly growing and profitable business from self-serve subscriptions, we are particularly excited about the viral spread of the product within large enterprises, resulting in the average enterprise account growing 5.5x in its first year. Similar to what occurred at SurveyMonkey and Lynda.com, Lucid has been incredibly successful at rolling up these users into valuable enterprise contracts via an efficient inside sales team.